Cai Hong, named after the Chinese word for “rainbow,” is an unforgettable, Asian-themed slot brought to you by Real Time Gaming and available now at Slots of Vegas Online Casino. You’ll see the Chinese God of Wealth teaming up with the lucky rainbow to bring you luck and prosperity. The God of Wealth is pictured with a perpetually benevolent smile, and there are always gold coins and nuggets spilling out of his hands. With Cai Hong’s special bonuses and prize multipliers, those fortunes are sure to rain down on you from the heavens. Sign up now with a minimum $50 deposit to receive a 250% No Max Bonus and 30 Free Spins! Just use coupon code WEALTH250. In Cai Hong, the God of Wealth acts as the wild symbol, doubling wins when he appears. The Rainbow acts as the scatter symbol, and 3 or more of them trigger the free games feature, which just don’t stop piling on free games and increasing multipliers. Play for a chance to win up to 33 free games, a 15x prize multiplier, and a top prize of 50,000 times bet per line! 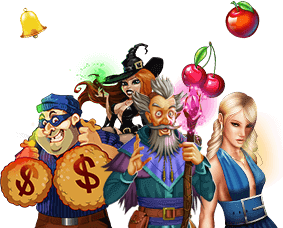 Cai Hong is a 5-reel online slot with 30 fixed paylines, which offers players an abundance of chances to win free games and bonus picks on every spin. Both the coin size and reel speed are adjustable, which allows you to customize your experience so that it’s best suited to your bankroll at your desired pace. Just select your bet size using the Up and Down arrows (we recommend betting max if your bankroll allows it), then click the Spin button to start playing. You can also turn on the Autoplay feature to watch those reels start and stop automatically. Cai Hong is designed to be just as suitable for penny slot enthusiasts and those players who like to invest a little more on each spin of the reels. With 5 reels and 30 fixed paylines that pay out from left to right, Cai Hong makes it possible to keep the wagers for the game relatively low or higher if your bankroll allows. The Autoplay feature is also convenient and easy to use. Just set a bet level and the number of spins you want to play. Sit back and enjoy watching the scatter symbols appear to increase your winnings, all without lifting a finger. When you’re looking to be more active, you can turn the feature off at any time. His appearance counts for all symbols except for scatters. The prize is doubled when the God of Wealth appears in a win. 3 or more Rainbows award 8 free games with doubled prizes as well as additional bonus picks – the more scatters there are, the more bonus picks you get. Free games are played at the same bet as the triggering game. The top award is 50,000 times the bet per line!